For detecting tumor protein p185erbB-2/HER-2 provide the basis of diagnosis in Breast cancer and ovarian cancer . erbB-2/HER-2 is a oncogene, the protein of 185kD(p185),the positive expression of p185 becomed a significant tumor marker of international generally accepted. This kit uses self-developed Anti-p185erbB-2/HER-2 Monoclonal antibody, and perform Biotin-Avidin IHC , cancer membrane Stained yellow means positive . (8) Allow the slide to drain, Shake off excess Liquid with a brisk motion and carefully wipe each slide as before ,apply E solution cover the tissue Sections ,incubate 10 min at Room temperature, Rinse in PBS for 3x5min;. (10) Rinse in distilled water ,or can do karyotin again when necessary; Dehydrate through Gradient ethanol, Clear in xylene, Coverslip with Gum. Reference value: compared to negative tissue slice ,the positive tissue slice should have 5% cancer membrane Stained yellow, immune reactions were continuous and linear around cell. Negative: the tissue Sections without stained, <5% cancer membrane Stained yellow, Staining intensity is Low. Low positive (±-+) :> 5% cancer membrane Stained yellow, immune reactions were not continuous and linear around cell . Staining intensity is Low,part of cell Stained. Precaution: The stained Cytoplasm can not be judged for Specific staining . 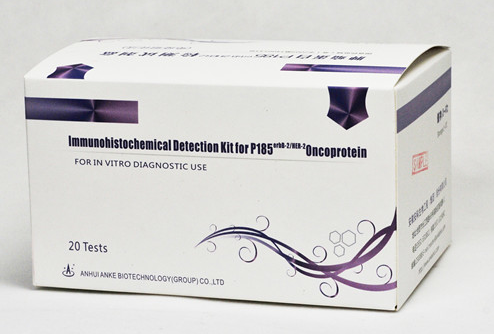 (1) By use this kit,the Sections without prior enzyme digestion or antigen rerival. Ankebio Buildings, 669, Changjiang Road, West ,Hefei, 230088, P.R. China. © 2006-2019 AnkeBio Co., Ltd Disclaimer Licenced Number ICP 05016497.